Any stage version of Frances Hodgson Burnett’s beloved children’s book hangs on the garden of its title. In Liz Stevenson’s production, the overgrown Eden discovered by young protagonist Mary Lennox hides in plain sight. All chilly colours, bare trees and shimmering mirrors, Lily Arnold’s design opens out to reveal secret spaces in the grounds of Misselthwaite Manor and its inhabitants, both of which gradually blossom. Jessica Swale’s adaptation reminds us that Mary arrives at Misselthwaite traumatized and bewildered, ripped from everything she has known. 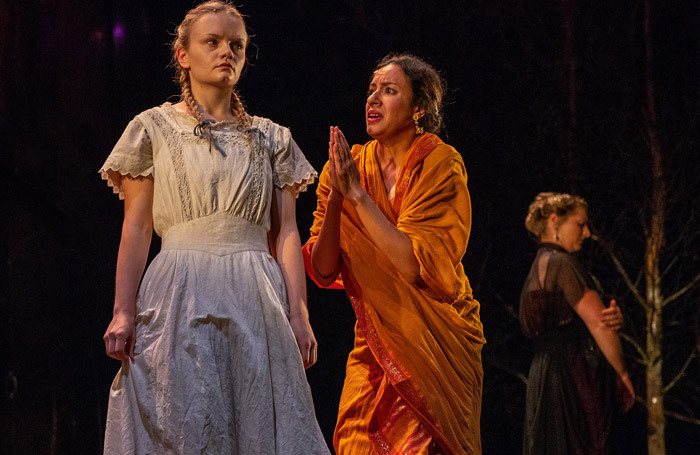 Newly arrived from India, orphaned Mary is played by Ella Dunlop with just the right mix of sullenness and vulnerability, capturing the brittle pride of a spoilt but unwanted child. Swale also refuses to skip over the uglier parts of Hodgson Burnett’s narrative, showing and implicitly condemning British colonial rule in India. For all these darker strands, though, The Secret Garden remains an essentially enchanting story, celebrating the simple magic of nature. As life returns to Misselthwaite Manor and its bereaved master, greenery creeps across the stage, while a disarming collection of puppets represent the teeming wildlife of the gardens. The show is also something of an ode to Yorkshire, from the no-nonsense wisdom of locals to the wild beauty of the moors. There are odd moments when the pace of the drama sags, and the purpose of the occasional songs added by composer Barnaby Race is unclear. But by the colourful, magic-filled closing scenes it’s hard not to be caught in The Secret Garden’s spell.